An overloaded billfold can destroy your back, but something smaller would mean abandoning your insurance card, not to mention dry cleaning coupons and expired condoms. 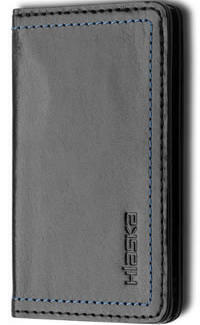 Keep your necessities while sleeking out your pockets, with Hlaska. An internet first-timer, Hlaska's Nominal line reduces size without losing functionality or style (they're made w/ Italian leather in vegetable-dyed hues -- meat refused to sit still during color extraction). Each model boasts its own unique features: the Coin rocks a snap-close change pouch, while the Merge eschews pockets, offering a card slot and an internal clip that clutches the money tight, thanks to magnetism/greed. Pushing streamlining to the limit, the Card Case employs just two slim pockets for cash, IDs, and business/credit cards; keep them straight, lest you surrender your corporate AMEX to a fishbowl, eyes a-glitter with dreams of free pizza. Hlaska also peddles full-sized models, like the Evergreen, embossed with accurate wood-grain patterns, and the racing-glove-esque Brisbane, perforated with almost as many holes as your woefully deciduous condom.